This is one of my absolute favorite dips, and is always a huge hit when I make it for parties, and I have thought about posting it here many times before. Partly I hadn't posted it before because it always gets all eaten up and then I have nothing to take a picture of the next day! But the bigger reason I have never posted it is because I felt silly posting a recipe that requires this many ingredients that I know most reasonable people will not own; we had friends for dinner recently who absolutely insisted we give them the recipe, so I figured it was time to go ahead and do a post about it. The recipe is from a great, but very complicated, middle eastern cookbook - Spice by Anna Sortun (chef of Oleanna in Cambridge, MA). Other than the strange ingredients, I have simplified this recipe a bit so that it is not too onerous to make, and it is well worth the effort. The dip has a delicious spicy-smoky-sweet and slightly sour taste that really is a perfect balance. Anyways, I have mentioned my love for Aleppo peppers several times here, including this post, and those are one of the obscure ingredients required to make this dip - you can get them at Penzeys if you have one near you, or at any number of places online. The recipe also calls for Urfa peppers, which I know you can buy in person at Formaggio kitchen in Cambridge, but also looks to be available from several places online too (which also stock aleppos, so you could order them together). If you didn't want to get both peppers, I think they are pretty similar in taste so you could also try just getting aleppos and then substituting them for the urfas. Finally, this recipe also calls for pomegranate molasses, which I have found at upscale food stores like Formaggio kitchen in Cambridge and PastaWorks in Portland, or is also available online. The recipe doesn't call for much and it keeps indefinitely in the fridge, so a bottle will last you quite a while. Ok, enough explanation, here's the recipe - let me know if you try it! I almost always make this using canned roasted red peppers and it turns out great, although I also bought a bag of roasted sweet peppers at the farmers market and used those recently and that was really great too. If you are making bread crumbs from a toasted slice of bread, rip the toasted bread into pieces and finely grind it in a food processor first. Then, add all the other ingredients and process until smoothly pureed. 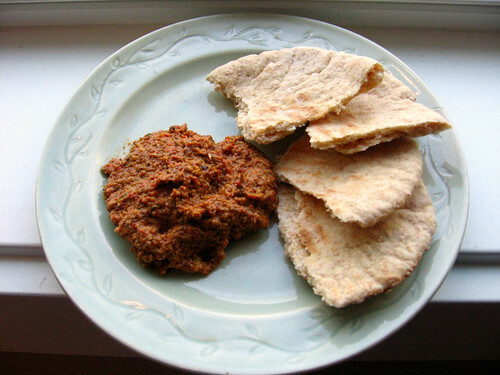 Serve with pita bread, crackers, or vegetables to dip. I'm linking up with Tuesday at the Table at A Quilter's Table! OH my, I would love to try this! I DO have pomegranate molasses on hand(!) but have not heard of the aleppo & urfa chilies - I'll be on the look-out at the market! Curious -- do you have Boston roots? Oleana and Formaggio Kitchen are two of my favorite haunts!